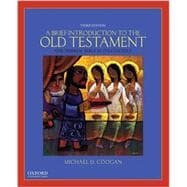 Engaging and accessible to students from all backgrounds, A Brief Introduction to the Old Testament: The Hebrew Bible in Its Context, Third Edition, is an updated and concise version of Michael D. Coogan's best-selling The Old Testament: A Historical and Literary Introduction to the Hebrew Scriptures, Third Edition (OUP, 2013). Coogan works primarily from a historical and critical methodology but also introduces students to literary analysis and other interpretive strategies. Providing a nondenominational and nondoctrinal treatment, this text offers a unique and captivating introduction to the Hebrew scriptures themselves and to how they have been--and can be--interpreted. * A FREE 6-month subscription to Oxford Biblical Studies Online (www.oxfordbiblicalstudies.com)--a $180 value--with the purchase of every new copy of this text. Michael D. Coogan is Lecturer on Old Testament/Hebrew Bible at the Harvard Divinity School and the Director of Publications for the Harvard Semitic Museum. He is the author of The Old Testament: A Historical and Literary Introduction to the Hebrew Scriptures, Third Edition (OUP, 2013), A Reader of Ancient Near Eastern Texts (2012), and The Old Testament: A Very Short Introduction (2008), all published by Oxford University Press. Cynthia R. Chapman is the Adelia A.F. Johnston and Harry Thomas Frank Associate Professor of Religion at Oberlin College, where she has taught biblical studies for twelve years. She is the author of The Gendered Language of Warfare in the Israelite-Assyrian Encounter (2004) and is currently completing a second book on maternal kinship titled The House of the Mother: The Social Function of Maternal Kin in Biblical Hebrew Narrative and Poetry. Box 3.4 "God" and "The Lord (God)"
Box 8.2 "An Eye for an Eye"
Box 10.2 The Meanings of "Torah"
Box 24.2 "I Know that my Redeemer Liveth"
Box 25.3 "Son of Man"